Middle English is an older type of the English language that was spoken after the Norman invasion in 1066 until the middle/late 1400s. It came from Old English after William the Conqueror came to England with his French nobles and stopped English from being taught in schools for a few hundred years. Over this time, English borrowed several French words. In the 1470s, the Chancery Standard, a type of English spoken in London, started to become more common. This was partly because William Caxton brought the printing press to England in the 1470s. The type of English that people spoke in England between then and 1650 is called Early Modern English. There were many different dialects of Middle English. 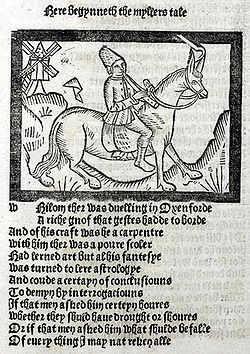 Geoffrey Chaucer wrote The Canterbury Tales in Middle English. ↑ Hammarström, Harald; Forkel, Robert; Haspelmath, Martin, eds. (2017). "Middle English". Glottolog 3.0. Jena, Germany: Max Planck Institute for the Science of Human History. This page was last changed on 10 July 2018, at 12:40.